The Red Accordion Diaries: Pool-side cubicle. Today, I attempt relaxing. It's not my forte. 17+ years of being self-employed means I'm never off-work, even though I'm technically able to give myself a day off whenever I want. Today I'm trying to combine the best of both: I'm working from the pool. 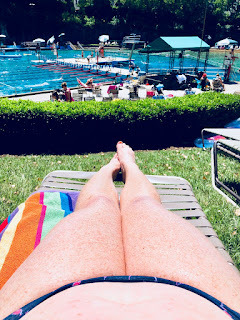 Part of this is because today is our au pair's first time at the pool with the kids, and I'm a super anxious former-lifeguard of a parent who had too much coffee this morning and whose head won't stop with the "what ifs." So I'm hovering nearby, not to spy, but to be near in case our au pair needs backup. (I still need to come up with a pseudonym for her because I don't like to say "au pair," and "nanny" isn't appropriate -- some au pairs even find it offensive because it's more cultural-exchange than employee. Anyway, I'll ask her to invent a name for next time!). I'm also trying to take advantage of my freedom and write emails and create setlists by the pool when I can. I tried to be sneaky and grab a chair in the far corner of the pool, but it took about 5 minutes before Graham popped up next to me and said, "Hi, Mommy! Can I have nachos? I saw your polka-dot swimsuit and hat, and I just knew it was you, even though you're wearing a swimsuit I've never seen before. And actually that swimsuit appears to have flamingos on it! Can you believe from a distance I thought they were white polka dots?" (laughs hysterically while stealing a nacho). Then Angus found me and we all had a good snuggle. They went back to play with insert pseudonym, and I ended up finding my own mother, who, in retrospect, perhaps was maybe also trying to snag a bit of alone time -- oops. Sorry, Mommy! She and I sat on the steps with our feet in the water saying nothing because, believe it or not, we are actually a very quiet family. We watched the boys get in the water with Pseudonym and watched them kick, splash, swim and laugh all the way across the lake together. Then Mom got on her scooter, went home, and I returned to emails and to my blog -- a place I haven't visited with regularity in years. My cubicle view (my first time sporting a two-piece, which I only bought for the flamingo swim shirt that came with it -- but don't worry, dermatologist-friend, I only bared the tummy for about 90 seconds before throwing the swim shirt back on. My belly shall remain white as the day I was born. Thinking back on my thus-far 90 minutes at the pool: I have not yet relaxed. Will now attempt to put away my laptop, slather in sunscreen and maybe re-load Headspace on the phone for the first time in 3 years. Think it's possible? Probably not. But I'm grateful for the ability to try. Updates on life with an au pair. Book reading by Silas House! So fun.